February begins this weekend, and so do many of the best Adirondack winter events! You can bring the family to a winter carnival in Saranac Lake or Lake George, party at the ice bar in Old Forge, or even participate in some outdoor activities. See what you can look forward to below! Ready for some cold weather fun? If so, then the Saranac Lake is the place to be this weekend! The 2018 Saranac Lake Winter Carnival will feature an “Adirondack Festival” theme, and events & activities will be held throughout the community. While you’re there, see the famous ice palace up close! 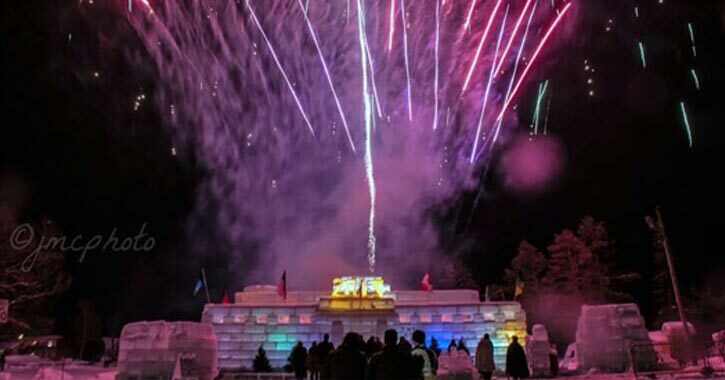 It’s time for the annual Lake George Winter Carnival to begin. The schedule of events for the carnival’s first weekend will include the popular outhouse races, a hot chocolate bar, fireworks, the carnival parade, a chili cook-off, and much more. Drive up to Lake Placid this weekend for the 2018 Empire State Winter Games! This multi-day sports event will feature over 30 winter sports events held at multiple venues in the region. Spectators are also welcome to hang out at the ESWG Village in Lake Placid for additional entertainment and activities. If you’re going to be in the Old Forge area this Saturday, then be sure to step inside View Art Center’s courtyard and check out their Ice Bar Party. Drinks will be available for purchase while you relax at the ice bar. Admission is free. Fire up your snowmobile and head over to Old Forge for the 19th Annual Poker Run on Friday. Pick up your card at a participating sponsor and then get it stamped from as many sponsors as possible. Come watch or participate in some snowmobile racing in the Town of Lake Luzerne this Saturday. The gates will open at 8:00am and the races will kick off an hour later at 9:00am. During the first Saturday in February, ice fisherman from around the region travel to Tupper Lake for the annual Northern Challenge Fishing Derby. This Northern Pike fishing challenge will take place at Simon Pond and run from 7:00am-3:00pm. Take the family to The Wild Center in Tupper Lake this weekend for a wide range of fun activities! You’ll have a chance to grab a pair of snowshoes and explore trails, see the river otters inside the museum, enjoy a warm beverage, and more. You won’t want to miss the next Cabin Fever Sunday at the Adirondack Experience in Blue Mountain Lake. This Sunday’s lecture will focus on the exciting challenge of climbing the 46 High Peaks in winter.